Magnetometer Batteries for GEM Systems, Scintrex and Geometrics Modern Mag • Accurate, safe and reliable ground magnetic surveys. GEM systems sales. 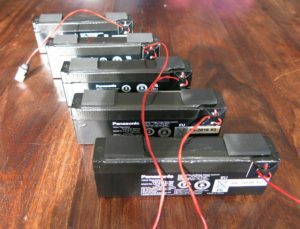 Scintrex and Geometrics magnetometers require heavy sealed lead acid magnetometer batteries greater than 7.2Ah in size. In contrast GEM Systems uses lightweight lithium Ion batteries and SLA batteries only 2.2Ah in size. While the SLA batteries are conveniently built in to the console, they do however need to be protected against a short circuit against the console case. GEM modifies and customises Panasonic batteries to fit into the console and protect them against short circuits in a number of ways. GEM systems Li-ion batteries have built in fuses and the GEM SLA batteries have built in polyfuses. Modern Mag does not recommend that customers create their own battery without sufficient short circuit protection. We recently received an overhauser console from a customer for repair. Upon closer inspection, the electrical tape covering the terminals on the non-standard battery had worn through and arced on the case. This was not unexpected since the battery was loose in the bottom of the console and able to rub against the inside of the console with every step. The result was a $2,200 repair bill from the GEM Systems factory. Modern Mag has GEM Systems proton and overhauser magnetometer batteries in stock and can produce GSMP35 batteries in about 2 weeks. If you are getting tired from lugging around HUGE lead acid batteries attached to Scintrex and Geometrics magnetometers, ask Modern Mag about a lighter Li-ion replacement battery. How do I get the Battery? Contact me via email or phone for batteries.